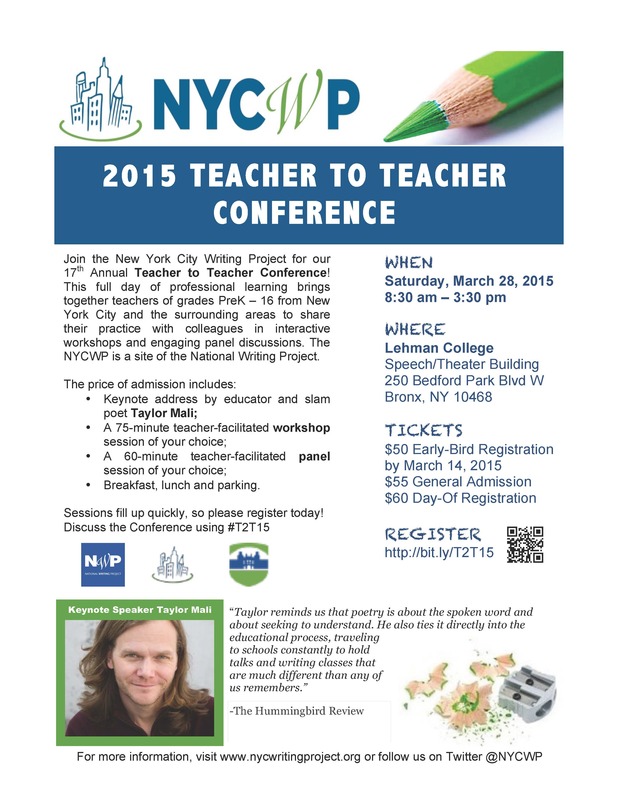 New York City Writing Project – Registration Now Open for the 2015 Teacher to Teacher Conference! Registration Now Open for the 2015 Teacher to Teacher Conference! Join the New York City Writing Project for a full day of engaging, interactive professional learning at our 17th Annual Teacher to Teacher Conference (#T2T15). The conference will feature 16 innovative workshops, 10 exciting panels, and a keynote address from educator and slam poet Taylor Mali! All workshops and panels are presented by current educators from NYC and the surrounding areas. Participants will receive credit for 7 hours of professional learning (toward the 175 hours required by some licenses) and leave with experiences, strategies and theory that are immediately applicable in classrooms of all content areas from grades preK – 16. Workshops and panels fill up quickly, so don’t delay! Register NOW at http://bit.ly/T2T15!